As the countdown to the referendum on Scottish Independence on 18th September 2014 begins, I thought – since this site emanates from Scotland – it might be a good point to present an analysis of our national Horoscope. I wrote this analysis, and commentary, as Scotland moved towards electing the first Scottish parliament for nearly three hundred years on the 6th May 1999. Fifteen years later, my closing comments seem eerily accurate…..
Non-astrologers, don’t click off! It might be interesting for you to see what astrological symbolism reveals about we Scots’ complex psyche…. The most commonly used chart for Scotland is that of the crowning of Malcolm the Second at Scone on 25 March 1005 at noon (see DATA at end of article). In this chart can be seen quite clearly some of the main themes which the wider world associates with Scotland. In a brief piece like this, one can only cover the most obvious. The first thing to strike the eye is the powerful emphasis on fire, with Leo rising , Aries MC, and both rulers in Aries in the tenth house. Mercury Venus conjuncts the MC from the Ninth House. This conjures up a picture of an exuberant, creative and confident nation not wishing to keep its talents to itself but launching them (in the shape of its people) out into the wider world. Scots are to be found everywhere, and every modern Scot has relatives in Canada, America and Australia in particular. Some of the world’s most famous explorers were Scots, David Livingstone and Alexander MacKenzie, who named the MacKenzie river in Canada, being two examples. Uranus, ruler of the Aquarian Descendant, is placed in the Ninth House in a watery grand trine with Saturn and Pluto. This conjures up a powerful image of strongly inventive and imaginative abilities which can structure the natural forces of nature in innovative ways: James Watt whose steam condenser leading to the steam engine drove the Industrial Revolution, and John Logie Baird who invented television, come immediately to mind. Uranus’ conjunction with Mercury, Venus, the MC and trine the Leo Ascendant combines restless travelling with innovative writing and artistic expression: Robert Louis Stevenson and Charles Rennie Mackintosh, neither of whom ended their days in their native land, but both of whom exerted powerful influence as writers and artists, fit this pattern well. Overall, Scotland is a country which has contributed to the positive dimensions of human endeavour quite out of proportion to its small size. Inevitably, there is a darker side to this bright picture, as with any nation. Saturn rising in Cancer in the Twelfth House is the powerful starting place from which to explore the painful side of Scotland’s complex sense of national identity. That identity under threat from an oppressive aggressor nation is a strong picture which arises from the square between the Twelfth House Saturn in Cancer, and Mars in Aries in the Tenth. There are many examples of this oppression by England over the thousand years since Malcolm was crowned at Scone. Memories of the brutal putting down of the 1745 rebellion against English rule, the infamous Massacre of Glencoe and the suppression of the Gaelic language which followed, and the Highland Clearances which forced thousands of Scots to emigrate in the eighteenth century, still fester in the national psyche. Mars in Aries in the Tenth is exuberant, bold and adventurous; the square to Twelfth House Saturn in Cancer shows the undertone of rage and pain at being torn from one’s deepest roots which lies behind that bright spirit. Poverty and oppression in many cases were the driving forces behind the Scots’ wanderlust. One of Scotland’s many paradoxes is that a great, and justified, sense of national pride seems to co-exist with angry feelings of resentment and a hidden inferiority complex; symbolically, this fits well with the square sitting behind Leo rising. If you are in any doubt about this, try keeping company with Scots who are the worse for drink, particularily if the location is England! One of the most unattractive facets of contemporary Scotland seems to be the need to put down (with the exception of Sean Connery !) those who have done well, rather than praising them. Scotland’s passionate and at times tortured relationship with the spirit at its different levels can also be seen from this chart. Look at the dominant grand cross involving the Cancer/Capricorn Nodal axis with Neptune, crossing the MC/IC axis T-square involving the prominent Sun and Venus. This is a highly imaginative, spiritual, musical, passionate,cultured, artistic, adventurous, justice-seeking, visionary pattern in its bright face. It speaks of the many gifts this small nation has given to the wider world, and through which its own national life has been, and is, a rich experience for many of us who live here. But its dark face is that of the maudlin drunk, abandoned by God, oppressed by England, singing exiles’ songs in some parochial bar, longing to return to the unchallenging safety of the womb/home – or failing that, the oblivion of alcohol. The 1005 chart reflects well the momentuous changes currently going on, as we move towards electing the first Scottish parliament for nearly three hundred years on the 6th May 1999. Prog Uranus at 4 degrees Aries is crossing natal Mercury and Venus (IC ruler) in the Ninth House, with prog Asc at 20 degrees Pisces close to natal Uranus, also in the Ninth. 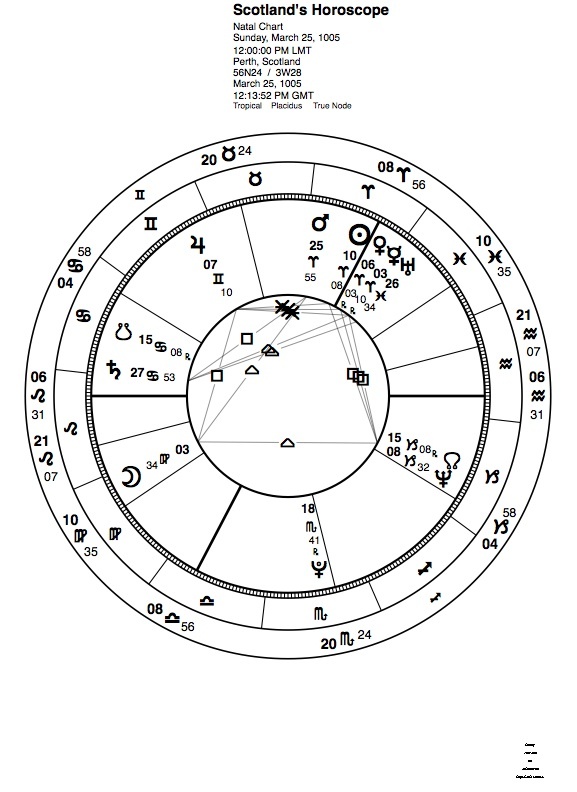 Prog Sun (Chart Ruler ) is conjunct Prog MC at 28 Sagittarius, both falling on the natal Part of Fortune – all indications of the radical nature of current changes, and the nation’s optimism and expansive spirit as it prepares for its first step towards self-government for nearly 300 years. Transits reinforce this. As the time of the elections approaches, Jupiter crosses all the Aries planets at the top of Scotland’s horoscope, as well as the MC. During the whole period since the sweeping New Labour victory in May 1997 made a Scottish parliament a reality instead of a romantic nationalistic fantasy, transiting Pluto in Sagittarius has been opposing Scotland’s Jupiter in the 11th in Gemini, square the 2nd House Virgo Moon. Scotland’s Sun/Moon midpoint at 8 Gemini is also opposed by Pluto from Spring 98 until the end of 1999. These are very appropriate significators for the debate centred around beliefs and values and the proper allocation of resources which has been going on; also, there is a death/rebirth process going on in Scotland’s ties with England and the UK. The outcome of that is by no means clear, many Scots wanting nothing less than the end of the long marriage with the UK. This entry was posted in 02 - New Posts: January 2014 onwards, Astrology Article Archive 1 – "Not the Astrology Column", Scotland's Horoscope and tagged 1005 chart, Charles Rennie MacIntosh, David Livingstone, Highland Clearances, James Watt, John Logie Baird, Leo Rising, Malcolm Canmore, Massacre of Glencoe, Robert Louis Stevenson, Sean Connery. Bookmark the permalink. So here I come, with my very first comment about that place called Scone. Would that be where scones-the-food come from? If so, I’d make pilgrimage. There’s nothing better than a good scone. I’ve been trying to think of the Scottish people I know. There’s you, and one semi-anonymous fellow who was at Weather Underground for a while – and I think that’s it. How can that be? I suspect it isn’t, and that there are other Scottish people around me whom I just don’t know. Very, very interesting post. And speaking of independence, traditions and such – an exhibit containing the Magna Carta opens tomorrow in Houston. It’s going to be here until August. I’m anxious to see it. The place “Scone” is pronounced “Skoon” and as far as I know has little or nothing to do with scones which I agree are ambrosial when made well, warm and fresh, with daubs of melting butter……mmmmm…. On a more serious note, I’ve found a site which I must actually go back to myself, which gives a range of international journalists’ perspectives on the upcoming Referendum vote. At the bottom, there are loads of sensible articles on different aspects of this whole issue, if you have the time or inclination to read them! Fantastic chart and works so well with the nature of our small country. Thanks for posting this Anne especially under the current political situation. Gosh, that was quick! Yes, I must admit to being pretty amazed myself at how much the Uranus/Pluto square sweeping its turbulent and disruptive swathe across the world both politically, environmentally and – of course! – in the small realm of personal lives, is clearly impacting on Scotland’s thousand year old chart. Fascinating post! Thought you might be interested in my short film Death Is No Bad Friend about Robert Louis and Fanny Stevenson in San Francisco: http://www.indiegogo.com/projects/death-is-no-bad-friend/x/1089930 Best regards, G. E.
Thanks for dropping by,G.E! I am interested in Robert Louis Stevenson (used to use his fascinating horoscope with my astrology tutorial classes),watched your film clip,and went on to contribute $10 to your campaign. However, when I was about to pay through PayPal,the recipient shown to whom the support appeared to be going was “The poet and the flea market” – so I’m afraid I quit at that point. Perhaps you can enlighten me….and I wish your film every success. Very sorry for the confusion! The Poet and the Flea Market is just my Storenvy online store, named after my graphic novel “The Poet and the Flea” about William Blake (http://thepoetandtheflea.wordpress.com). So please try again and thanks for your contribution!! Best, G. E.
Thanks for clearing that up, G.E. I will drop by tomorrow and donate. What a good way of using the web to find funds, given our collective governments’ willingness to spend vastly more on destruction via wars, etc, than on fostering creativity. It might be worth putting a brief note of explanation somewhere so that when people go through to donate, they won’t be put off, as I was. Just a thought…..
ps have just done so, plus sharing on Facebook and Twitter and Following you on Twitter. Namaste! Anne, I’m fascinated and impressed. I’ve been told that astrological charts indicate trends or possibilities but where these complex trends often prove accurate, I wonder just how much control we have to change what seems destined? Thank for this affirming comment and thoughtful question, BP.It’s a question to which no human has yet come up with an answer which we know to be correct – but maybe wrestling with the mysteries of life is ultimately more creative and productive than finding definite answers…. A fascinating question with which to wrestle, in relation to astrological symbolism where the centuries-old consensus probably is “The stars incline but they do not compel”,is this one: do individuals ultimately have more free will than collectives, eg nation states? As an astrologer, I make quite a few preparatory notes before meeting with a client; I concentrate on attempting to understand the CORE meaning of a number of key patterns which the horoscope reveals, jotting down some of the possible branches of expression arising from that core. But what I do not know, and cannot know, until the person walks through my door, and we engage in dialogue, is the level of consciousness at which the client is operating. That elusive but vital factor is what determines whether someone is going to be squashed and diminished by eg a very tough line-up such as Mercury conjunct Saturn conjunct Pluto – or tempered and focused by it. I am glad for that elusiveness which even the best minds in science have never been able to pin down. It makes life more interesting – and more creative. And I know from my own life experience as well as professional experience in astrological and other fields, that the level of consciousness and self-awareness brought to life’s challenges largely determines what it is possible for a person to achieve given the broad limits set by genetic inheritance, family background, social, educational and cultural factors – or by the symbols which a competent astrologer contemplates in preparing a horoscope. The less self-aware individuals are, generally speaking, the more it would appear that their lives are concretely determined by any/all of the above factors. I suppose it is harder for nation states to achieve the level of collective self-awareness required where, for example, they might be more inclined to examine their own internal shortcomings and find ways of co-operating internally to improve the lot of their citizens, than to project their woes outwards and blame some external oppressor for the condition in which they find themselves. We might have fewer wars on Planet Earth had we arrived at this state of cultural evolution! So from that point of view, perhaps it is easier to predict possible outcomes and be reasonably accurate. There is a whole branch of astrology – Mundane astrology – which studies the affairs of nations. Just that one branch would take up a whole lifetime of study. Perhaps we should suggest to our national and international leaders that they take up this study. They might be less inclined to rash and destructive courses of action, eg in the shape of instigating pointless foreign wars, if they did! But I see I am now beginning to rant, so must sign off. I hope at least some of this is of interest to you and maybe other folk who may drop by this post. So much food for thought! I do agree that “wrestling with the mysteries of life..” can manifest as great creative expression and productivity if we can open up and take that leap. I love what you said in the paragraph on nation states…that it is harder for them to achieve the level of “collective self-awareness required…” This resonates with a recent response I made to a comment you left on my blog on the Robert Frost poem, Reluctance. Many thanks for the Reblog, Grandtrines! Thank you! Yes, Jude Cowell has been around for a long time and produces consistently interesting work, as well as being generous in her support of other writers. Well, I think these exercises have their place, but I find that a good hard deadline and word limit is what it takes to get my imagination going – as well as ( when I don’t have a deadline ) simply allowing images to come up from wherever… When the same image comes up more than three times I know I’ve got an idea worth pursuing. I agree re: the power of deadline pressure. “Manufactured” deadlines (as you point out) can sometimes achieve the same result.